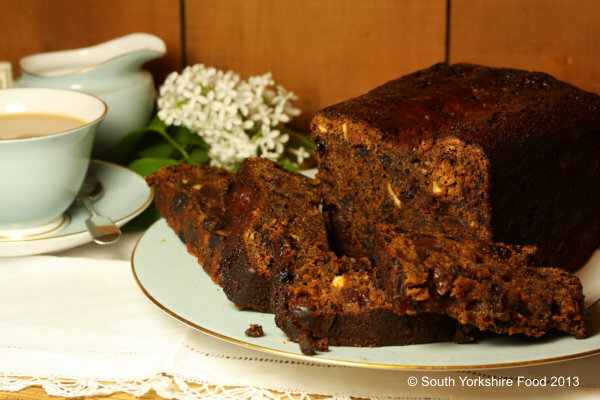 Yorkshire Tea Loaf is dark, rich, and sticky with great flavours of fruit and a hint of rum. It's somewhere between a fruit cake and a loaf. It is also known as Barm Brack, or just Brack. Delicious as a tea time treat, sliced and spread with butter, or with chunks of a good strong cheese like Wensleydale, or a mature Cheddar - the sweet and savoury combination is a marriage made in heaven! Place all the dried fruits in a large bowl, pour the tea over, stir well. After 15 minutes add the rum or cognac and stir well, then cover with cling film and leave overnight. Preheat the oven to 190°C /Fan 170°C. In a large bowl, pour in the fruit mixture and stir in the sugar and black treacle. Add the flour, mixed spice, baking powder, and egg and mix well  you will get a fairly wet mixture. Pour the mixture into the tin and bake until cooked - about 60-90 minutes - until dark golden on top. A skewer inserted into the centre should come out clean. When cooked, allow to cool for a few minutes in the tin before turning out onto a wire rack. You can now glaze the cake if you wish, by brushing with a little honey dissolved in hot water. Leave on the rack to cool completely before eating.